Before I get irate comments about Borobudur, which is in central Java, Candi Sumberawan is a lesser-known – and only – purely Buddhist monument in East Java. The collapsed stupa sits at the foot of Mount Arjuna, where the local villagers still attend to it. 05 June 2007 (Webdiary) – Pardon the dramatic title, but this story has all the elements of a juicy drama – the unheeded warning, botched-up work and revenge of a supernatural nature. The mismanaged construction of the Australian embassy in Vientiene beside a 17th century That, or stupa, said to contain the relics of a Laotian prince is now returning bad karma in kind. Melody Kemp wrote about the background of the Vientiene That in November of 2006; since the start of construction works, the That has suffered some damage and now she posits the Australian community in Laos is suffering bad luck in kind. It’s probably older than European settlement in Australia, but a new Australian settlement next door threatens to destroy it. One of Vientiane’s oldest relics, an ancient That (stupa) which reputedly contains the remains of a wayward prince, is being threatened by earthworks on the site for the new Australian embassy in Lao. The That which sits adjacent to the site, is thought to have been built around the 16th or 17 century and is one of the few remaining structures from the ancient Laotian Lang Xang Kingdom. The Abbot of the neighbouring Wat (temple) Nak Yai and keeper of the That, is concerned that the rumbling bulldozers excavating the foundations for the embassy, may cause the already leaning top of this ancient structure to topple. It would, he said, be a very inauspicious beginning for the embassy and spell bad luck for all Australians living in Vientiane. Indeed. Several months ago I wrote about a 17th Century That (stupa, in this case containing the bones of a sexually profligate prince) threatened by the construction of the new Australian Embassy in Vientiane. 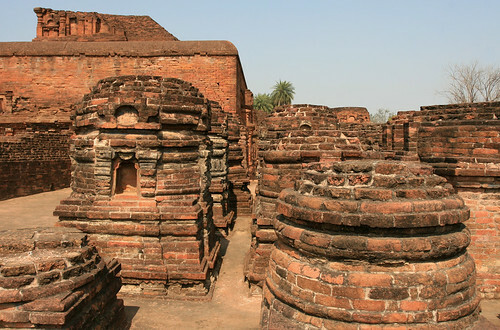 The risk to this ancient structure made of low fired friable bricks, was a matter of great concern to the guardian, Buddhist Abbot Bounyed, whose Wat (temple) adjoins the site. He told me then that if the That fell, it would spell perpetual bad luck for the Embassy and all Australians in Lao. Well, due to Australian incompetence and lack of diligence, it looks like I am sentenced to a few years more bad luck than what I would get from a broken mirror. I met an erudite archaeologist working in Lao. A man of great humour and curiosity, he told me that not only had the That cracked as I had been advised the week before, but parts had indeed fallen, a victim of pile driving. An Australian environmental consultant resident in Lao had been assured earlier by Embassy staff that piles were not going to be used. 1 April 2007 (San Jose Mercury News) – Another tourist’s account of Indochina, this time to Burma, through a three-week archaeological tour. Woozy from jet lag and blinded by a golden reflection of light, I was struck speechless the first time I saw Shwedagon Pagoda. The shimmering bell-shaped stupa reigning over the 14-acre Shwedagon complex – and indeed over the city itself – is the heart and soul of Yangon. Devotees and visitors come to pray, meet friends, meditate, burn incense, chant or, like me, to just stand dumbstruck. I still might be standing there if I hadn’t become engrossed in the traditional clockwise stroll around the mosaic-covered columns, spires, prayer pavilions and hundreds of images of Buddha that fill every nook and cranny. The glistening 32-story stupa is topped by a golden orb studded with 4,350 diamonds and precious stones. Inside, away from the faithful and onlookers, are said to be relics of Buddha. So it’s easy to see why it is the most revered site in Myanmar, the Southeast Asian country formerly known as Burma. To our little band of Westerners, it was Wonderland.